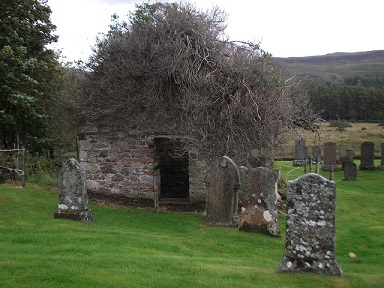 Situated within the Applecross burial ground and within the Scheduled Area of Applecross’s monastic settlement is the roofless remains of a chapel believed to date from the 15th Century. The medieval chapel is recorded as being used as a burial vault by the Applecross family in 1859, but had become roofless by 1953. The chapel is now seriously deteriorating with extensive ivy all that holds much of the walls together. Management of The Applecross Chapel lay with Highland Buildings Preservation Trust (HBPT) for over two years before ALPS took over the reigns. ALPS has submitted an application for funding with Historic Scotland for works to be carried out on the chapel. These proposed works will restore the building to a consolidated ruin, ensuring that it is safe for visitors and no longer in danger of crumbling further. If successful, local craftsmen will be recruited to undertake the work in the traditional manner, using traditional materials. Once completed, the chapel will be open to visitors and its very important history will live on. ALPS will provide match funding through the Heritage Lottery Fund grant. To date, some of the required work has already been undertaken as a matter of urgency: the ivy to prevent further damage. A project brief has been drafted and quantity surveyors have been to site to assess the work required to bring the building to a consolidated ruin status.